21 Feb 12, 14:04 Is the imminent war against Iran a BlogosFear or real? What is your view on the fact that the Iranian oil bourse will start trading oil in currencies other than the dollar from March 20? Will this trigger a real war? Will the tension between the western countries and the Syrian-Iran axe affect the market in the future or is this all part of the blogosFear's ammunition? Yeh, it is a lot like the perma-bears, in fact the imminent attack on Iran mantra has been running for over a decade. I recall there was a big deal in the media and BlogosFear about what was supposed to be a definite attack on Iran in 2007, that at the time I wrote about and gave a low 15% probability of happening. The way I see it if the US / Israel are going to attack Iran's nuclear infrastructure then they will just do it, not broadcast it ahead or better still do it in a way that does not directly track back to them i.e. ferment an internal insurgency so as to destabilse Iran. There is definetly a covert war going on as witnessed by Israel blowing up Iranian scientists and Iran countering by targetting Israeli's. Therefore, I would rate the probability of a direct attack using military forces (air / sea) against Iran during 2012 at about 10%. And I would rate the probability of a ground war Iraq style at about 1%. So there is a 90%+ Probability that the BlogosFear will be wrong for another year. Not Iran, but MEK terrorists staging a classic Israeli/American "false flag" operation. The Israelis always fight their battles in the media first, playing the victim card again and again. Why is volume so low at the moment? Presumably if the smart money were on your trail you would see a hell lot more people buying into this? What do you mean by this? What is the best mechanism you can recommend in forecasting accurate trading scenarios? Where do you see GBP/USD going for the next year or so? volume - has been low for the duration of the bull market. Trading - That line does not read too well, its in the context of the whole paragraph which is that the most improtant indicator one needs to pay attention to is whether ones account is growing or contracting rather than any technical or fundemental indicator. Sterling - Currently I hold very little foriegn currency, or aim to hold in the near future, so no real incentive to analyse. Are these rapidly rising oil prices ($122) a threat to the UK economy now, or do they have to rise to perhaps $150 before it really bites? Nice to hear from you again. I've also used this opportunity to reduce my equity position. But I've actually increased my long commodity positions since December. It looks like commodities overshot to the downside relative to the stock markets late last year. If indeed we see a volatile sideways range in equities this year and not another major correction, can't help but think that the risk/reward favors commodities? Rising oil prices are a reminder not to be duped by central bank falling inflation propaganda. 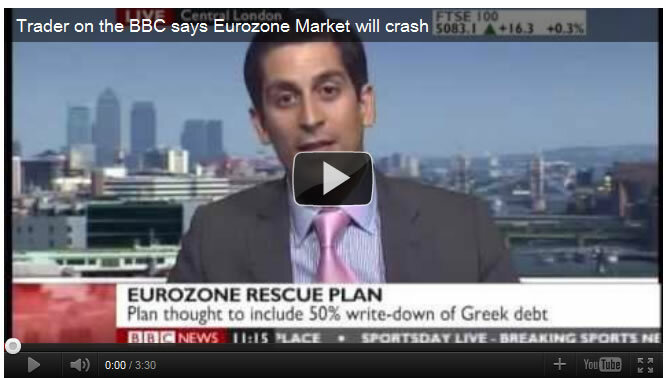 and it will act as another excuse for MORE QE money printing. The bottom line my UK GDP growth forecasts remain unchanged from near 2 years ago which is for 1.1% for 2012. Apart from precious metals, I remain fully exposed to commodities (especially oil) and miners, though will likely sell some to reduce my exposure to the stock market over the next 2 months. This inflation mega-trend will run for a decade so there will be plenty of minor blips on the way. What are you thoughts on the U.S. dollar. With the current euro zone crisis, it is difficult to perceive the U.S. dollar dropping, but then again, if the markets have to rise it is in tandem with a falling dollar. Which one is going to give? When you talk of the inflation mega trend are you warning of the cumulative affect (on life savings/net worth) of official CPI (let alone real) inflation persistently higher than the BoE target - eg. 5% or 6% like we've been seeing recently. Or are you talking about this growing into something more serious like we saw in the 70s or worse ? Yes the tendency is for the dollar to fall for stocks to rise approx 70% of the time. Overall, the Dollar is not acting too bearish, in fact we could be in for what could turn out to be a multi-year dollar bull run, but this requires proper analysis rather than a quick glance. 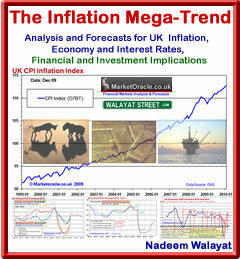 The inflation mega-trend of persistently high inflation above BOE target will last the whole decade. However in addition to this is the real threat of an inflation panic event which for instance could be triggered by a chain reaction collapse of the banking system which contrary to what the academics state i.e. deflaiton will instead be highly inflationary as governments freeze bank accounts for weeks or months whilst the recapitalise ALl of the banks via unprecidented money printing. How high could inflation go during such an event, I can only guess, perhaps an annualised rate of at least 30%. You are continuing to reduce your overall net long exposure. Will you start to short stocks as a strategy? Also, have you thought any more about doing your article on the secrets of successful trading? I don't short stocks just indices, its how I hedge portfolios or trade deep corrections (when I am able to recognise them). Thanks Nadeem for your reply. My interest is that I have a deferred final salary pension which I won't be using for 25 years or so and it will only rise in line with CPI upto a maximum of 5%. So this could get heavily eroded in high inflation environment and obviously wiped out in a hyper inflation environment. I've been offered an enhanced transfer value so am weighing up whether to take this transfer money into a personal pension and invest in stocks (dividend income paying stocks) instead. It's a difficult decision. Anything can happen in 25 years! "...what I see but have not had time to write about is the Great Inflation of the housing markets of the UK and USA of 2012 onwards..."
Pending your in-depth analysis, could you give a quick heads-up on what you see happenning, particularly in relation to the London housing market. Good time to buy or not? Everything is always clear in hindsight but by then its usually too late. if it were me I would go with CPI linked, as part of a portfolio of pensions (I presume your employer will contribute a hefty % as well as the tax mans contribution ). i.e. Pension 1 - as above. Pention 2 - SIPP - stocks, bonds and commodities. So pension 1 would be a low risk component even if inflation erodes it, it 'should' be balances by higher risk components. This way the ups and downs of the markets should not effect you pschologically as they would if most of your pension were in stocks, you will then make mistakes and even lose more, perhaps ALL of it. The final salary pension is closed, so no more contributions to it. I either keep the benefit which maybe eroded by inflation or take the cash into a personal pension pot and then i'm on my own! If I took the money I've calculated I'd have to double it in real terms (well after CPI anyway) over the next 25 years - assuming annuity rates stay the same (big assumption but I have no idea if they will be better once this low interest rate environment has gone or worse because of increasing life span!) and CPI stays under 5% mostly. All I'd need is a growth rate of CPI + 3%. As the market historically returns approx 2% after CPI plus dividends (another 2 or 3%) this to me seems very achievable as long as nothing disasterous happens! On balance though I agree with you - that from a balance point of view (I aready have an equal amount in a stock market based pension which is likely to become my main pension) I should stick with this CPI linked and spread the risk. 1. Based on your expectations don’t you consider gild and silver a suitable investment? If not why? 2. Do you have precious metals mining stocks? If not why? You could take it and bung it into index linked gov bonds that are RPI linked + a little extra interest. 17 Mar 12, 13:16 No correction expected around this level? Just wanted to know that Are you expecting any sort of 5% to 10% correction around this level 13200, Or we are just going higher before any sort of decent correction? Hi Nadeem: You mentioned on the 17 March you would do an update the day after....your views would be greatly appreciated on latest indice climate. Hi Nadeem, In the event of Bernanke starting QE3 to lift the US economy later in 2012 do you still feel that the Dow Jones 14K upper forecast will hold? What's your view on the prospects of Japanese equities? Do you think that the Bank of Japan's latest QE policy will weaken the yen enough to give Japanese companies a big enough export boost? It also seems Japanese companies have been streamlining their business; increasing shareholder value. I'd be very interested to hear if you think this much maligned market may be finally be worth investing in and if so whether you recommend a particular ETF?